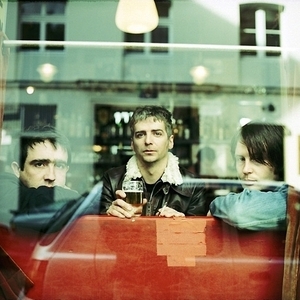 I Am Kloot are a band formed in Manchester, England in 1999 by John Bramwell (guitar/vocals), Peter Jobson (bass) and Andy Hargreaves (drums), notable for their twisted, witty lyrics. Their Debut single To You on Ugly Man Records was produced by and featured backing vocals by Guy Garvey, lead singer of ?lbow. Debut album Natural History was released in the United Kingdom in March 2001 on Wall of Sound offshoot We Love You, followed by I Am Kloot in September 2003 on the Echo label. Their Debut single To You on Ugly Man Records was produced by and featured backing vocals by Guy Garvey, lead singer of ?lbow. Debut album Natural History was released in the United Kingdom in March 2001 on Wall of Sound offshoot We Love You, followed by I Am Kloot in September 2003 on the Echo label. Disputes and issues with the label began to arise towards the end of the promotional campaign for their sophomore album, when Echo said that Proof would be a single. Artwork had been agreed and a tracklist too, they had even gone so far to commission a video by Krishna Stott featuring Christopher Eccleston (who would later star in the new Doctor Who television series) contributing a powerful scene. But Echo shelved these ideas and ended up issuing the single as a download only, although a few copies were issued in Europe on the PIAS imprint. Their third LP Gods And Monsters was released in April 2005, again on the Echo label but issues with the label again cancelling a single at short notice, this time I Believe, leading to the band leaving the label, citing a lack of financial support. Later that year they issued a limited edition single entitled Maybe I Should released November 21st, following their biggest ever headlining gigs in the UK, culminating in a show at the famous London Astoria venue. They released 'BBC RADIO 1 JOHN PEEL SESSIONS' on October 30th, 2006; a compilation which contains two Peel sessions and other rarities. Their fourth LP I Am Kloot Play Moolah Rouge was released commercially on April 14th 2008, and a limited edition version of 2000 copies was on sale to the public attending their show at Manchester Academy 3 on 24 November 2007, and the following dates on their mini-tour of England and Europe. In September 2009 they released a compilation album of B-sides, rare recordings, sessions, and previously unreleased material: entitled B. The band have finished working on their fifth LP with producers Craig Potter and Guy Garvey from Elbow. The title is The Sky at Night, and is available now. Random fact: "Kloot" literally means "testicle" in a derogative form in both Dutch and Flemish. When the band was first told this by Dutch DJ Jan Douwe Kroeske during the recording of a live performance, they were dismayed.